Quality miniature glass 7-pin tubes manufactured in Australia by Pjilips. 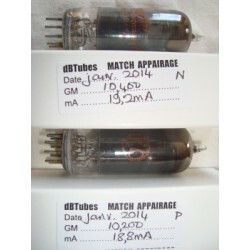 These duplex-diode-triode tubes are designed for radio use, one diode as detector, the other diode as AVC rectifier, and the high-mu triode as amplifier. With gray plates and top halo getters, these tubes are printed in white MINIWATT MADE IN AUSTRALIA 12AV6, and coded 163. Boxes are standard yellow and blue, printed 12AV6.